So I went on Google Maps like I have always done in New Zealand. It was reliable to me in the white man's country & I expected it to provide me with a basic map of the general area. Boy did I get a shock when I discovered that the map I received for a secluded location in Kuching was just as accurate & detailed as a map I would get for a street in New Zealand! It was so accurate that all names are actual names & not English translations. 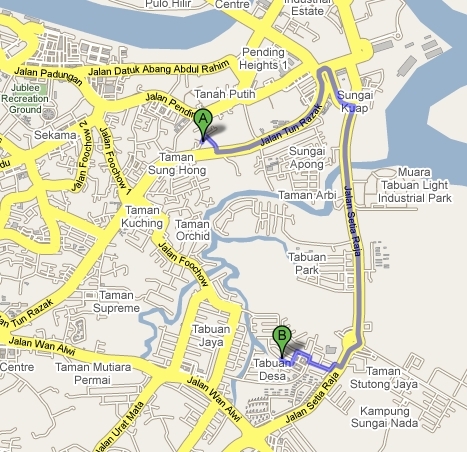 Lorong this, Jalan that, Taman this, Lebuhraya that & etc. It is also so detailed that small lorongs, landmarks, LRT stations, schools & hospitals are even on the map! I could even get directions from one place to another! Now you got a reliable easy-to-use map free on the net!